We are loving our new app! Access sports scores, cafeteria menus, news updates, and even emergency notifications, right from your pocket. Download the app on Android: http://bit.ly/2FyEfC3 or iPhone: https://apple.co/2Fvlrnn. 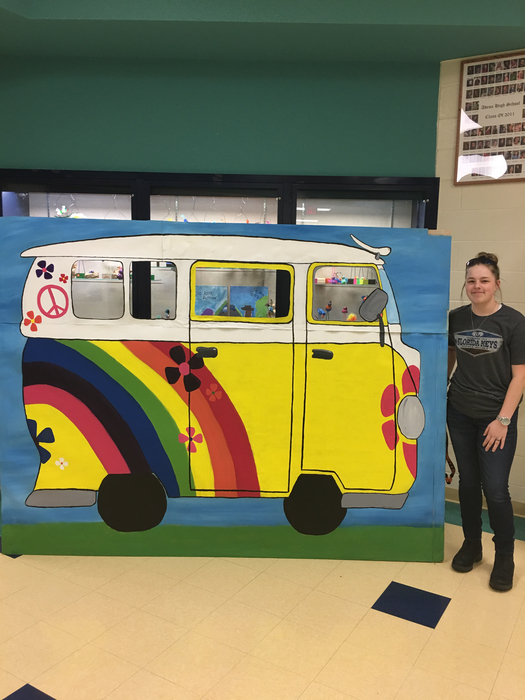 Adena student Natalie Lauderman created a retro VW van for photo ops at tonight’s Buck Fifty checkpoint here at the school- get your picture taken and have a groovy time at our checkpoint! Thanks for sharing your time and talent Natalie! Good Afternoon, This is Superintendent John Balzer with an update on today’s incident. 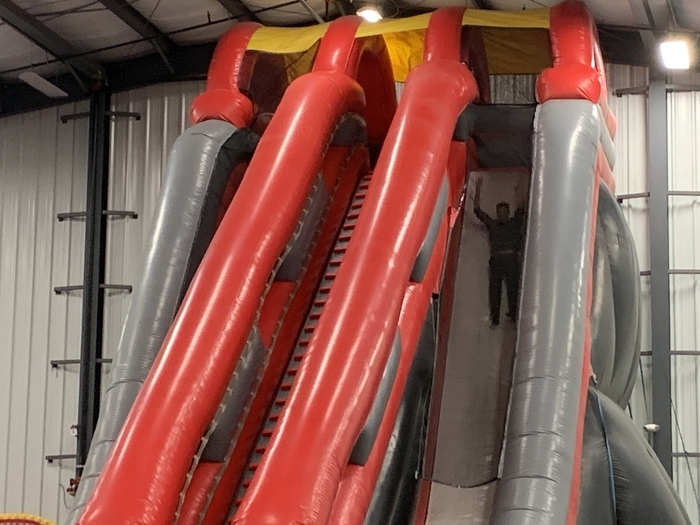 The Ross County Sheriff’s office requested and received the Pickaway County canine unit to take through the building and check lockers and cars in the parking lot. The search did not yield any contraband and Law Enforcement continues to monitor the building to provide peace of mind and reassure students of their safety. I want to take a moment to thank the Adena Staff for their quick response and precision with handling the protocols for the lockdown. We want to thank Sheriff Lavender and all the deputies who responded and assisted us today. Most importantly, I want to thank the students who responded to the training provided to them regarding (If you see or hear something, SAY something.) As always, the safety and wellbeing of students and staff are our first priority. 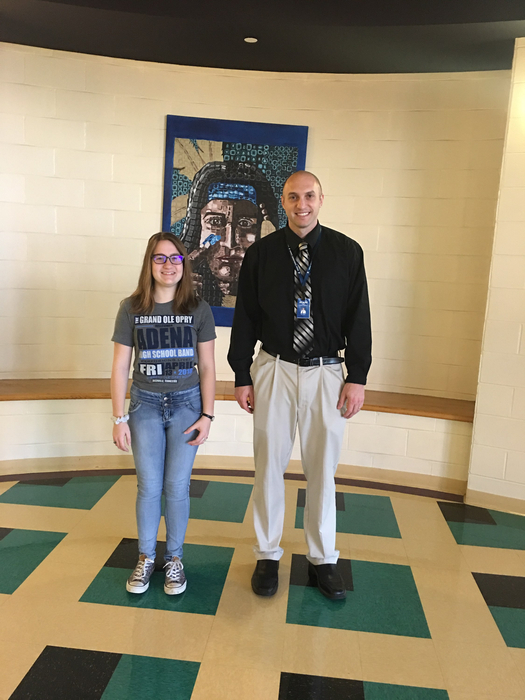 Knowing an incident like this can be upsetting to experience, if your student or you as a parent or guardian would like to speak with one of our Integrated Services Counselors or Adena Guidance Counselor concerning today’s incident, they are available to assist you. Please call the school office to arrange to speak with one of them at your convenience. Thank you. The current lockdown at Adena Local Schols has been lifted. Authorities have removed an airsoft gun that a student had brought to school. Every student Pre K-12 is safe. 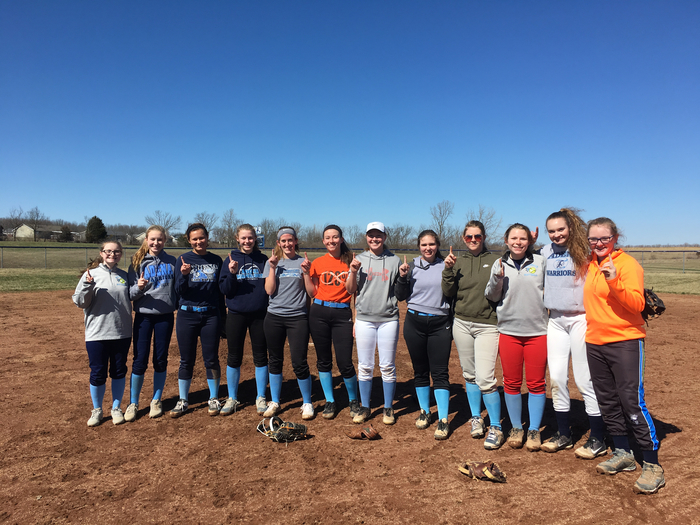 The Junior Class recently participated in a mulch sale to raise money for their senior trip to Walt Disney World next year. 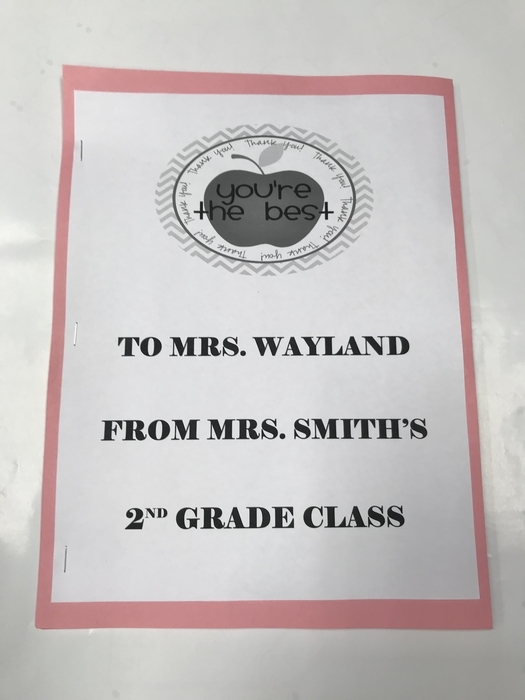 A trip that Mr. Mathis has been planning for the class. 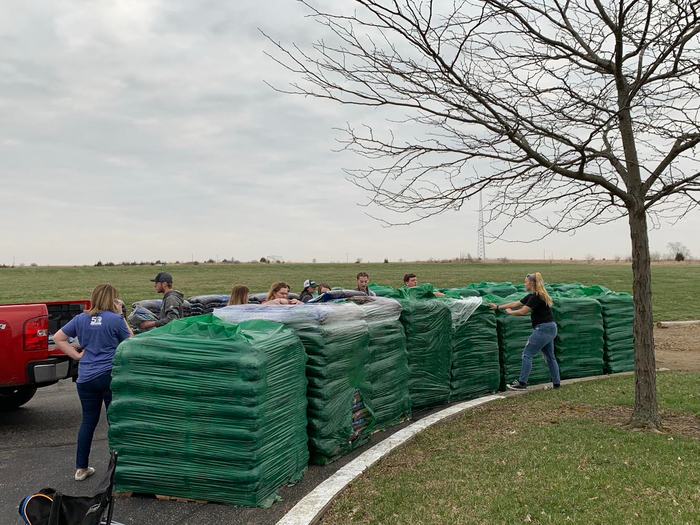 Overall the students sold 1800 bags of mulch and earned $1 per bag towards their senior trip. 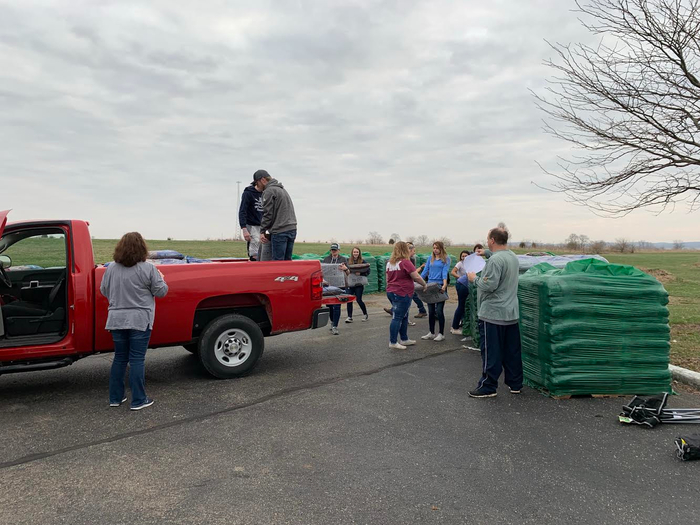 Last Saturday, students and some teachers met early at the school and to load trucks, trailers, and a dump truck to make deliveries to their customers. 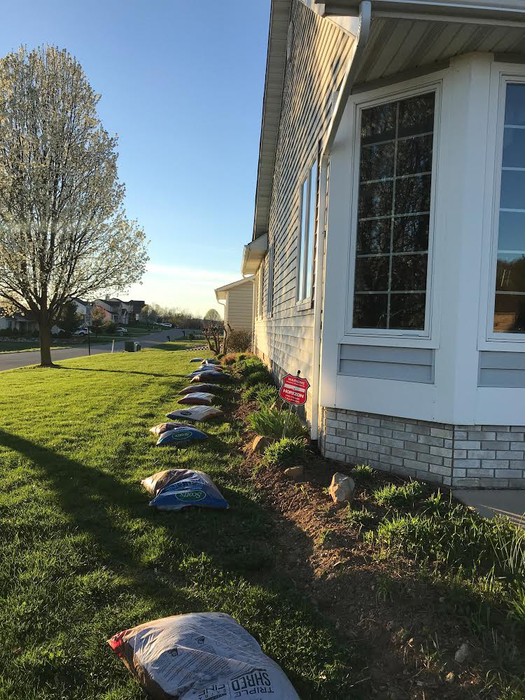 Some even spread the mulch for their customers. Congratulations to Savannah Robinson! She is the March Student of the Month for the high school! Results are in for the Farm Business Management online contest. Garrett Simmons, Maddie Huff, and Laura Meyer competed against 719 students from around the state. Garrett Simmons placed in the top 40%; Laura placed in the top 25%, and Maddie placed 8th overall, putting her in the top 1%! Congratulations to all participants! In honor of National Poetry Month, Ms. Nusbaum’s Advanced English III block participated in Poetry Coffeehouse this morning. 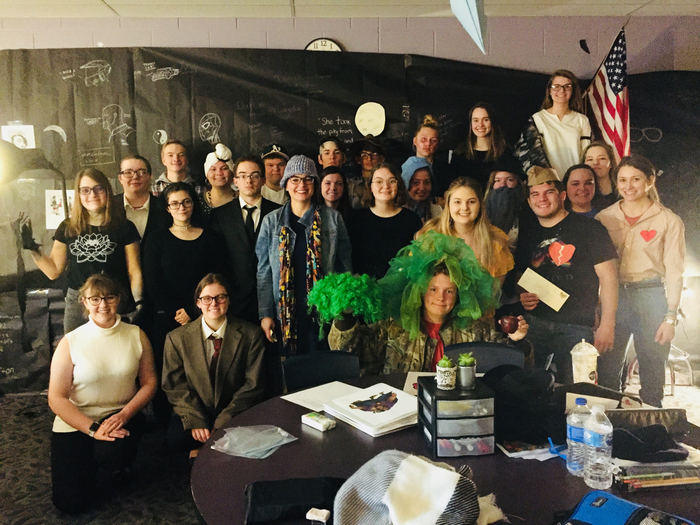 Each student was required to memorize a poem from an American poet and create an interpretive performance with costumes, props, and art. Every performance was memorable with its own unique mark, and the students worked hard on making this a great success. Adena Ag Day April 11th, Adena Local Schools will host the Brothers of Wilmington College FarmHouse along with the Sisters of Sigma Alpha Sorority (Agricultural professional fraternity and sorority) as they present Ag Day to the students of grades K-4. Students will experience farm equipment, livestock and demonstrations along with agricultural related topics that students in our area would find relevant to their daily lives. The event will take place from 9:30 to 2:55 (weather permitting). We would like to invite area farmers to attend as well! Thank you to Adena graduate Kainnon Bryans along with Morgan Ritz, organizers of the event. Come see us Thursday! 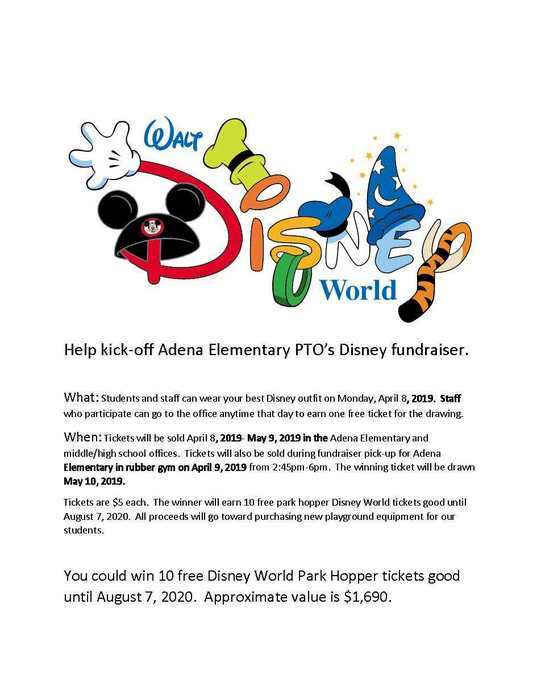 Please take a look at the PTO Disney Fundraiser information attached. 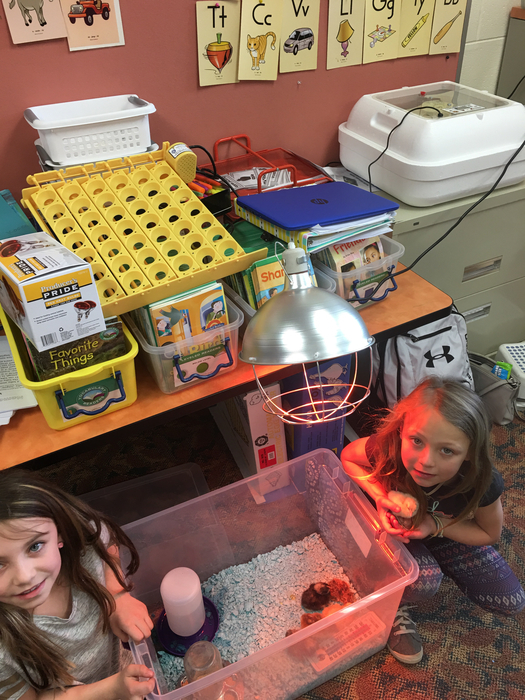 Students in Miss Lovensheimer’s first grade class welcomed baby chicks to class this week. Students watched the eggs for three weeks as the incubator did its work. 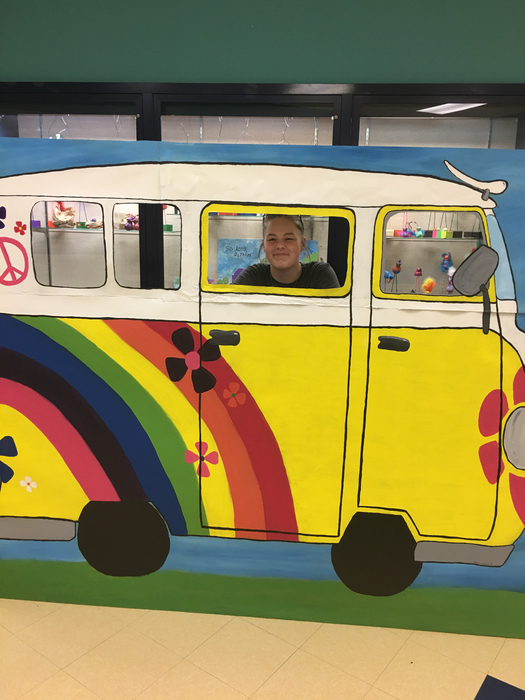 Miss Lovensheimer brought the project to her students as a result of a workshop offered by The Ohio State University this summer. What a great way to connect Adena’s students to their agricultural heritage! Pictured are Alexis Saltz and Eme Sever who really became involved with the project. 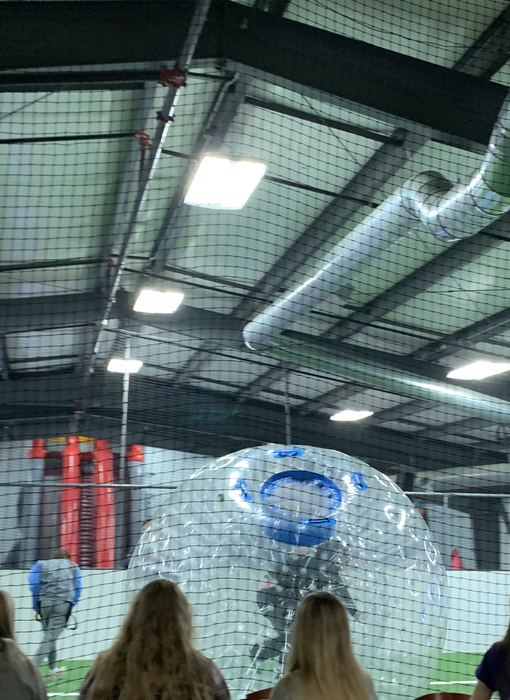 Thanks Miss Lovensheimer for connecting our students to real life experiences! Danbarry Cinemas and Triple Crown hosted over 100 of our high school students today that were rewarded for good behavior, good grades, and very good attendance for the third nine weeks. 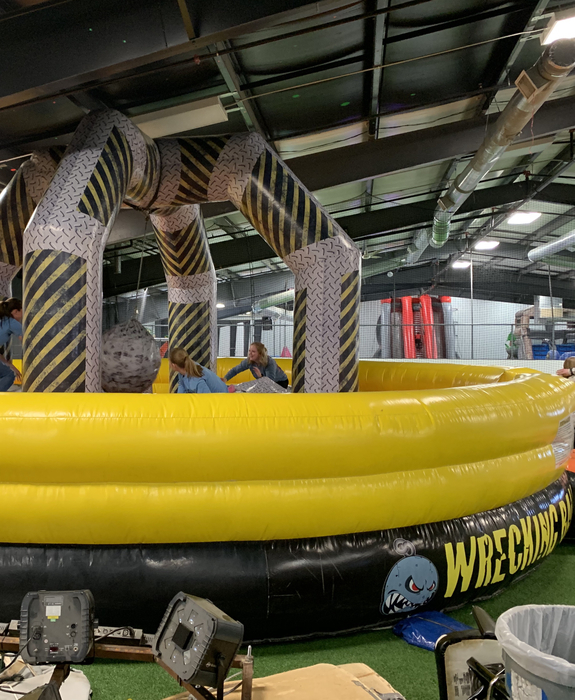 The students enjoyed the movie Dumbo and the multiple activities that Triple Crown offers. 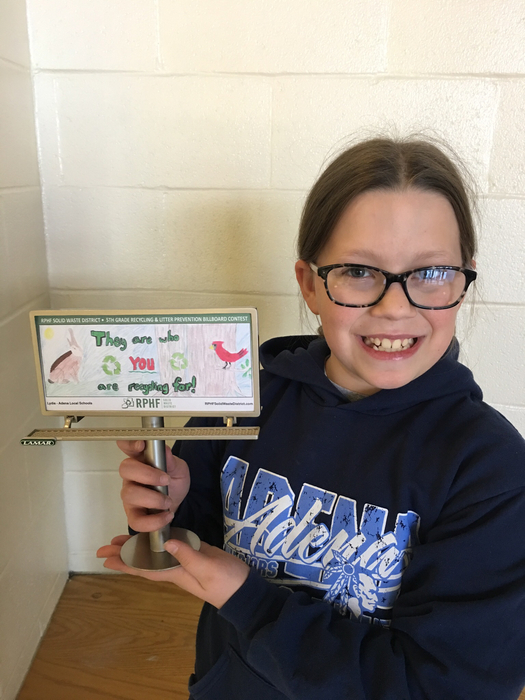 Congratulations Lydia Beery- winner of the Ross County Solid Waste District billboard contest. Look for Lydia’s design at the intersection of Route 138 and Route 35.Thank you, Lydia, for sharing your talent and care for the environment. Adena students are making a difference! 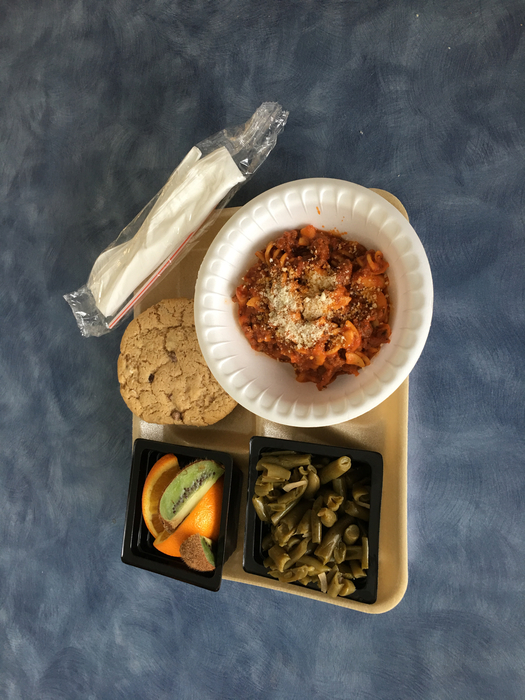 A great Adena cafeteria lunch to end a great week! Thanks ladies, for a healthy tray that tastes good too! 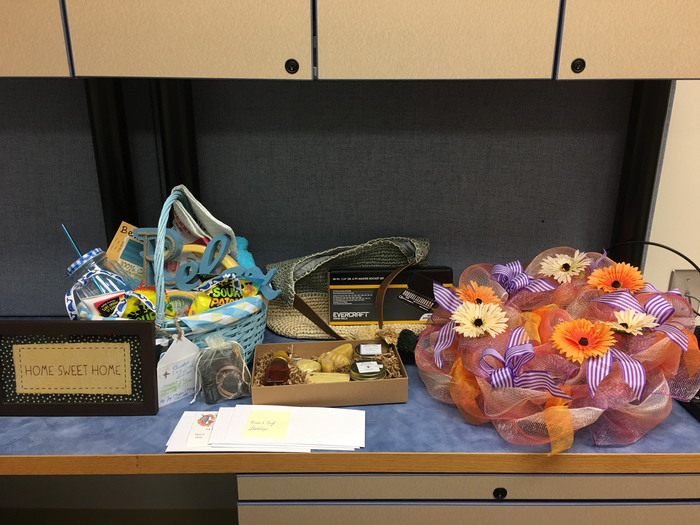 A sample of prizes available at the annual Adena Education Association Variety Show, Friday, April 5th at 6:30 p.m. proceeds fund student scholarships. Join the Adena community for an evening of fun and enjoy the local talent! Good Luck Lady Warriors! 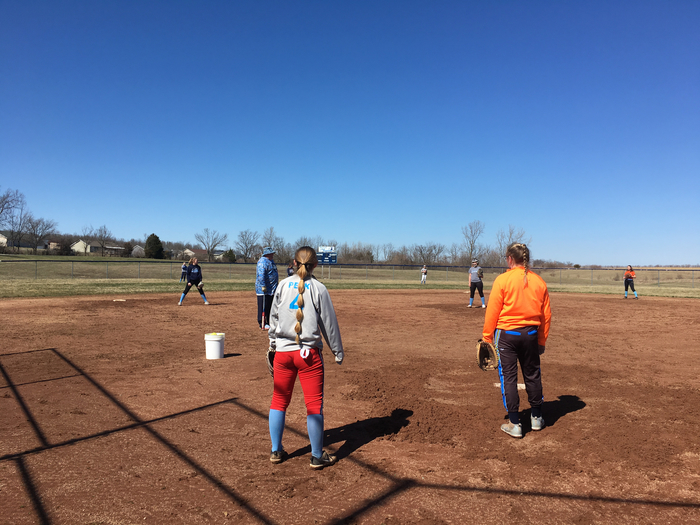 Season Opener at Vinton County March 27th and JV March 28th at Hillsboro. 8th Grade Washington D.C. trip final payment due Friday, March 29th. The district has been working hard on a new website over the past couple of months. We hope to launch this in the next few weeks. Exciting things are coming in the near future. The development of an Adena Local Schools App is also in the works. We hope everyone had a great March break!! Looking forward to seeing everyone back in the building tomorrow. Don't forget about the community pep rally tonight!!! Starts at 6:30 in the HS Gym. Go Warriors! !